"Transit signal priority" is one of the easiest, most cost-efficient ways to speed up buses. What's holding DOT and the MTA back from rapid implementation across the city? Giving buses priority at traffic signals has improved speeds by an average of 18 percent on the five MTA routes where the technology is live, according to a new DOT report [PDF]. “Transit signal priority” (TSP) could reverse a citywide decline in bus speeds that has caused riders to abandon bus service in droves — but only if DOT and the MTA apply it at scale. Currently DOT is planning to roll out TSP on a few routes per year, even though all traffic signals are already equipped with the needed technology, and all MTA buses will be TSP-enabled soon. Given the sorry state of NYC bus service and the potential to make major improvements, advocates are pressing the agencies to greatly accelerate the rollout of TSP. NYC buses spend about 20 percent of the time stopped at red lights. TSP works by reducing the length of time buses are immobilized, holding green lights longer for approaching buses or shortening the length of red lights where buses are stopped. NYC has had some version of TSP since 2006, but DOT and the MTA didn’t settle on a technological platform until 2012. Afterward, the agencies were still slow to expand the use of TSP, which is now active on five routes: the M15, S79, Bx41, B44, and B46. On those routes, buses sped up between 5 and 30 percent after TSP was implemented, according to the DOT report, with an average drop in travel time of 18 percent. While TSP is better suited for some bus routes than others (DOT says Midtown isn’t a good fit), these are significant improvements which suggest that on its own, widespread implementation of TSP would more than offset the 2 percent citywide decline in bus speeds between 2010 and 2015. DOT is only planning to implement TSP on a few bus routes per year, even though all intersections are already equipped with the needed techonology. The key word is “widespread.” By 2020, DOT is planning to have TSP operational for just 20 bus routes, a small fraction of the 238 routes citywide, and about 1,000 of the city’s 12,000 signalized intersections. Of all the policy levers available to speed up buses — more bus lanes, faster fare payment systems, redesigned routes — TSP is truly low-hanging fruit. With the MTA’s whole bus fleet due to be TSP-enabled “soon,” according to DOT, the only remaining cost is planning. Transit advocates with the Bus Turnaround Coalition point out that NYC has fallen far behind London, which has six times the number of intersections equipped with TSP, and even Los Angeles, which has more than twice as many intersections with TSP. DOT has shown it can rapidly accelerate its signal work — the agency has been adding head starts for pedestrians to hundreds of intersections annually, after previously averaging 16 crossings per year. 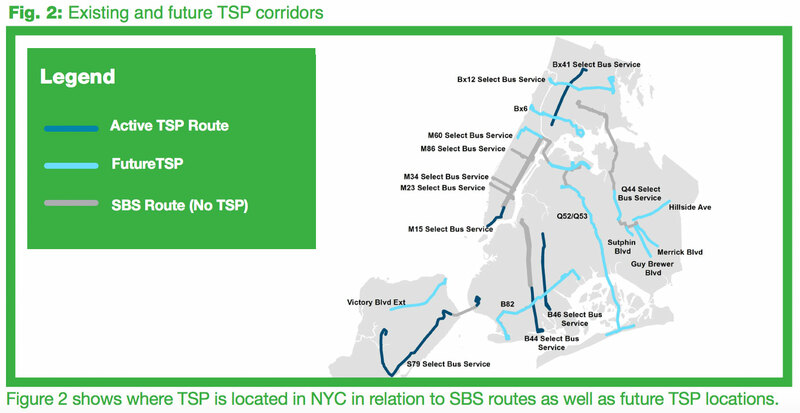 The Bus Turnaround Coalition is calling on DOT and the MTA to generate a joint plan to expand the use of TSP citywide, beyond routes that get the full suite of Select Bus Service improvements. Instead of 20 bus routes with TSP by 2020, they say the goal should be 20 more routes with TSP each year, starting now. The NYCDOT report should be classified as fake news. Here’s why. The comparison uses only 4 lines. In each of the four cases, the before time was before SBS was implemented. This means there are several factors at work, not just tweaking the traffic signals. Let’s enumerate the comparison periods. The NYCDOT report did not mention that the before period was before SBS was implemented. Check out the individual SBS progress reports, which break down the different factors that go into the SBS time savings. Does anyone know when the Stevie from the Block’s full album is supposed to drop? None of the progress reports for these routes, that are available on NYCDOT’s website, shows this information. The progress reports for the M15, S79 and Bx41 were written before TSP became operational. This leaves only the B44 report. This report, unlike the others, divides bus travel into 3 segments: moving in traffic; stopped at bus stop and stopped in traffic. There’s is no separate category for stopped at red light.